Sometimes, it can be a dog eat dog world out there, and that seemed to be the case for five pups caught in the chaos of this summer’s BC wildfire in the Cariboo area. When a wildfire evacuation order was issued for Williams Lake this summer, five furry pups found themselves stuck in between a rock and a hard place. Their family had children who needed to be evacuated which meant there wasn’t room for the pups to tag along, so they were left behind in the loving care of their neighbours. But when the threat of wildfire picked up and those neighbours had to evacuate – the dogs were left to fend for themselves. Just when it looked like it had all gone to the dogs, one of our Commercial Vehicle Safety Enforcement (CVSE) staff said “dog gone it all” and stepped in to help. 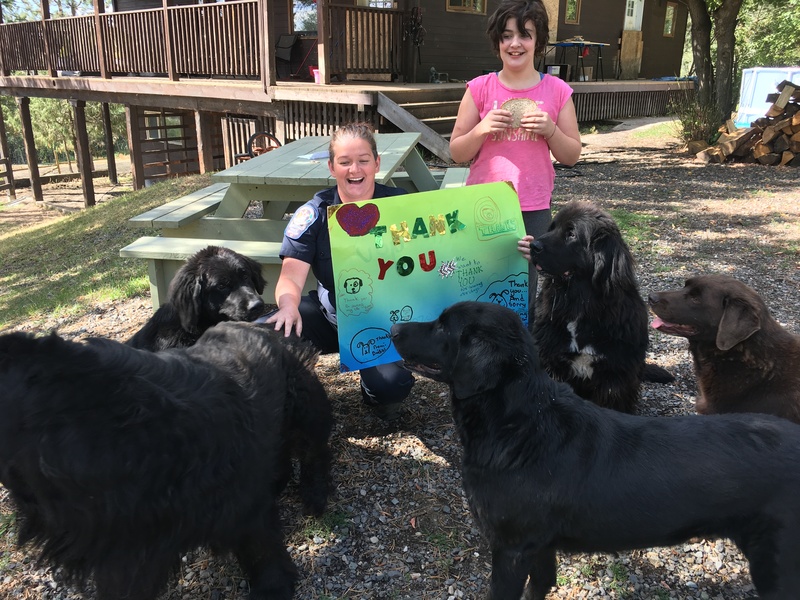 Kirsten Konge, a CVSE officer on duty to help with the BC wildfires in the area, had heard about the pooches’ predicament and travelled out to see them. Once there, she decided they couldn’t stay. There was no power, which meant no access to water. 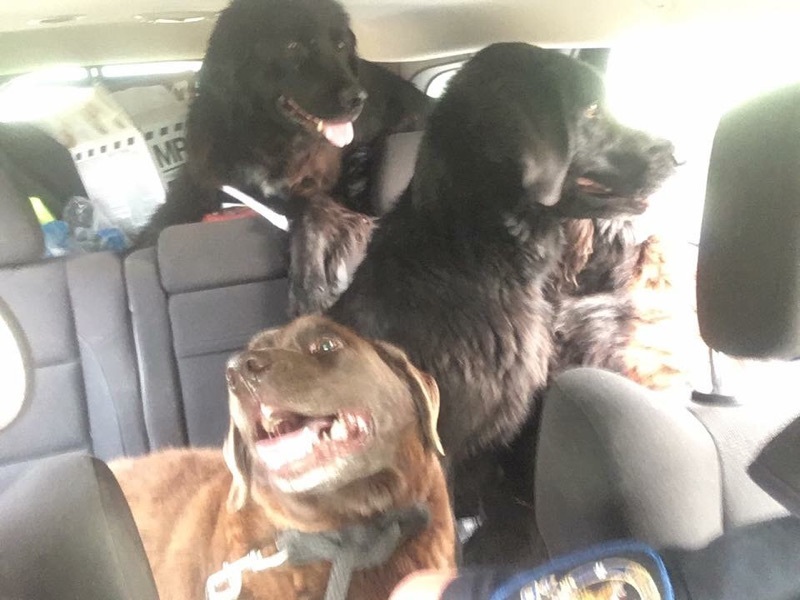 She packed the dogs (four Newfoundlanders and one Chocolate Retriever) into the back of her car and brought them back to the house where she was staying in Williams Lake. Gratitude for Kirsten’s good deed is expressed in licks, wags, smiles and colourful art. “Hershi, Toby, Tidbit, Tippy and Daiszi. I finally learned the names of the dogs that we rescued over a month ago from the Spokin Lake fire in BC’s Cariboo region. These guys and girls made it back home recently and when I went out to their home recently I was greeted warmly by dogs and humans alike,” Konge said. “The last time I saw the doggies there was a very active fire in the area. During a welfare check I decided they needed to be evacuated, so I brought the dogs back with me to Williams Lake. I filled up a swimming pool for them, a little kiddie swimming pool, and they took a spin through that. The Newfoundlanders loved the water,” Konge recalled. 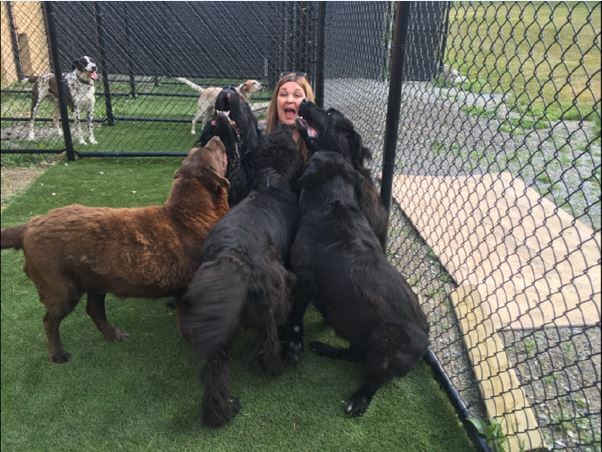 Julie, the dog’s owner and her pups, reunited in Prince George. We’re happy that you work for the ministry too Kirsten – you’ve made us proud! Thanks for sharing this sweet story with us and for going above and beyond to help out these lovely pups during the BC Wildfire emergency. Do you have any questions about this or anything else we do? Let us know in the comments below. 4 Responses to Gone to the Dogs – it’s CVSE to the Rescue! I cannot even fathom being put in that situation. Thank you Kirsten Konge for going above and beyond to rescue these animals! Thanks James, animals are always worth every effort.